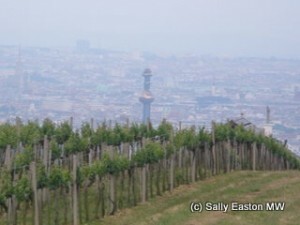 Austria 2010 was pretty tough going, though there are plenty of lovely wines. It was one of the lowest volumes in almost 25 years, nearly a third lower than the average yield of 2.5mhl. It’s a vintage that will fit the cool, classic mould. “A vintner’s vintage” concluded Miesbauer. Fresh, perky, citrus nose, lifted, grassy, fresh cut grass (quite sauvignon blanc like in this respect), then green and peppery. Good length. Good. Grass and a hint of light apricot, fresh with some attractive depth and concentration. Good. Spices and real depth of peaches and cream on the palate. The merest hint of sweetness lifts it all up and accents the extra dimension. Good. Fragrant, peachy, aromatic, nice intensit. Spicy and firestone, rich and concentration. Peach and pepper nose, steely, acacia, smooth, good concentration of straightforward, dense, primary fruit flavours. Good. Sweet aromatic pepper on the nose, light white pepper, white peach, light-medium body, attractive purity and elegance. Good. Peach and the beginnings of tropical fruit, full and lush with pineapple, mango of appreciable density and succulent balance. High tasty quotient. Good. Peach, nectarine, spicy aromatics, dense, ‘sweet’ fruits, compote, lush and not quite full. Veering to sweeter balance, and attractive for that. Has richness in non-complex style. Long. Peach and honeyed apples, zesty intense attack, rich with firestone and non-fruity intensity. Big immediate intensity and palate-grabbing flavour, sweet concentration, but not sweet wine. Very good, long. Peaches and cream, full fat, tropical and lush fruit, with glycerol sweetness. Rounded style, and good. Gunsmoke nose with tropical fruit. Full and rounded in aromatic spicy, and attractive manner. Intensity and concentration with frame and length. Good. Cooking apple compote on the nose, perky, fresh, intense, a wine that buzzes the palate and wakes the senses. Lovely balanced just-ripe fruits, crunchy and juicy. Very good. Apples, crunchy, fresh, perky, linear in straightforward way. Super intensity of primary citrus, apples, white pears, with good concentration. Long. Apple, citrus, with hint of pear on the nose. Fresh attack to palate with crunchy ripe, primary fruits of good intensity, well framed and proportioned. Long. Good. Peachy, hints of apricot on the nose, and with a gently balanced mid weight tone and texture and fresh, perky core. Well proportioned and balanced. Good. Peachy nose, sweet ripe peaches and preserved lemon fruit on palate. Enticing and moreish, in fresh, intense, primary, non-complex fashion. Very good. Spicy, rich, firestone, peachy, tropical, complex. Lush without being sweet, well framed, strongly proportioned but not muscley. Lovely and very good. Peach blossom, hint dry honeyed perfume. Peachy palate, some sweet richness on the mid palate with a smooth and enticing texture. Seamless and fresh. Very good. Peaches and cream with a pause for meditative thought right there. Bewitching nose of bass perfume notes, lush with a steely and magnolia-fragrant core in a full body. Slightly mesmerising, and really very good indeed. Peaches and cream, medium weight, veering to fresh tropical fruit, sweetly balanced and framed. Well proportioned, with freshness and elegance. Good. Gentle, sweetly-spiced nose, Fresh, and nicely balanced with white peachy fruit, and sweet ripeness. Good. Gunsmoke with dense peaches and cream, fresh, linear, with huge depth of fruit. Very good. My research trip to Austria was sponsored by the Austrian Wine Marketing Board. But can you explain something to me – I get that a cooler year will lead to higher acidity, but how do longer fermentations lead to higher residual sugar ? I thought it would be the other way round.